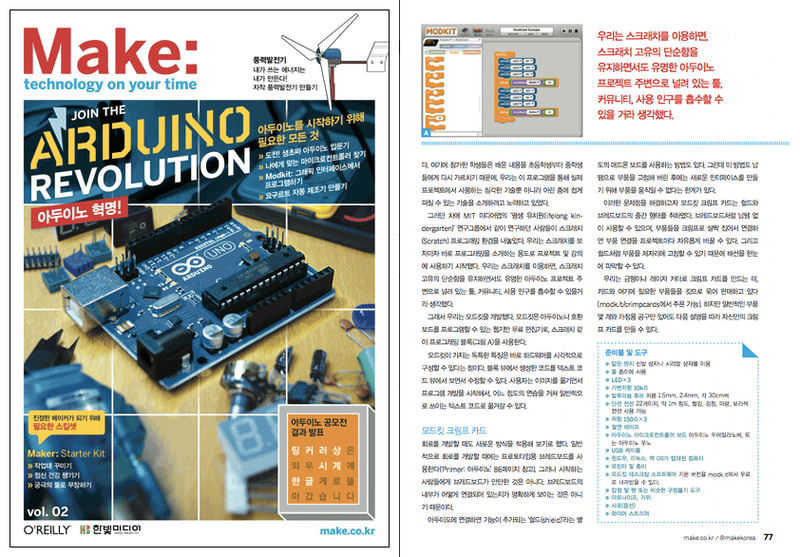 Volume 2 of Make: Korea featuring Modkit! We met Make: Korea editor Hee Jung while demoing Modkit at the World Maker Faire in New York last month. She told us that Modkit would be featured in the second volume of Make: Korea's print magazine. It seems that the format of each volume is to feature some new content as well as some translated articles from earlier volumes of Make. Speaking of Maker Faire and Crimp Cards, we have been busy working on the next wave of features and we didn't get a chance to mention our trip to Maker Faire in NY last month. While at the Maker Faire, we set up in the Maker Shed and demoed the Modkit graphical programming environment along with Modkit Crimp Cards. Crimp Cards are little circuits that teach the basics of input and output and that can be built without soldering. We did a pre-sale of Modkit Crimp Cards and got even more feedback on the kits. One of the highlights from the Maker Faire was when 10 year old Kofi Baafi took over the demo sessions, showing kids and adults just how easy programming can be with Modkit. We look forward to bringing Kofi along to more events in the near future! We had a great time at the Faire and even received another Editor's Choice Award for our engagement with the crowd. As always, we met so many new people and ran into many old friends. While the Maker movement has not yet reached everyone, the NY Maker Faire definitely has a bit more diversity than the Bay Area one and we can only work to increase that. We hope to see you all there next year! Cash Advance Chicagocredits but rather still work with sub-prime borrowers who qualify. Look at advance terms and rates. Not all online auto title advances accompanied similar terms or loan fees, so it pays to do a little examination shopping. Likewise, make a point to check the moneylender's approach about early reimbursement. riparare iPhone really was personable as well as truthful about their iPhone Repair. He fixed my husband’s Apple iPhone so quick and in the entrance of us. Highly recommend his solutions! The phone works perfect and appears brand new. We actually appreciated their understanding as well as customer support. Many thanks, Captain Repair!!!!! فيجب أن تقوم بمكافحة بق الفراش فور ظهوره فتقوم مؤسسة مكافحة بق الفراش ببيشة مؤسسة الفرسان بادخار جميع الخدمات والمواد القاتلة للحشرات القوية التي تقوم بالقضاء على حشرة بق الفراش وهدم أماكن تمركزها وتحصينها كلياً مع ضمان عدم عودتها مره أخرى كل ذلك في اسرع وقت جائز مع ضمان مواصلة الخدمات المقدمة من المؤسسة لضمان الحصول علي افضل خدمة سوف تجدها من ضمن مؤسسات مكافحة الحشرات.